The students of Group T took home 3 of the 4 prices after the event. 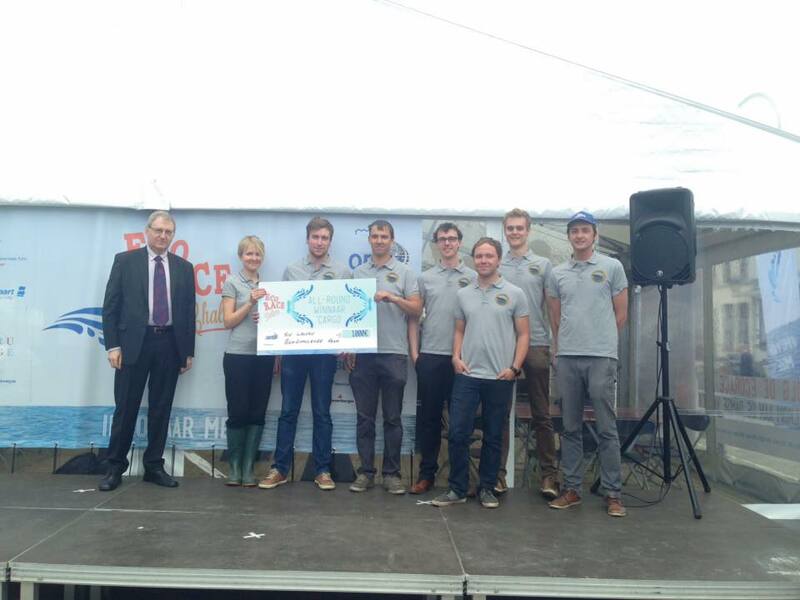 The KU Leuven Ecochallenge team won: 'the most innovative vessel' and the 'all-around best cargo' prices. 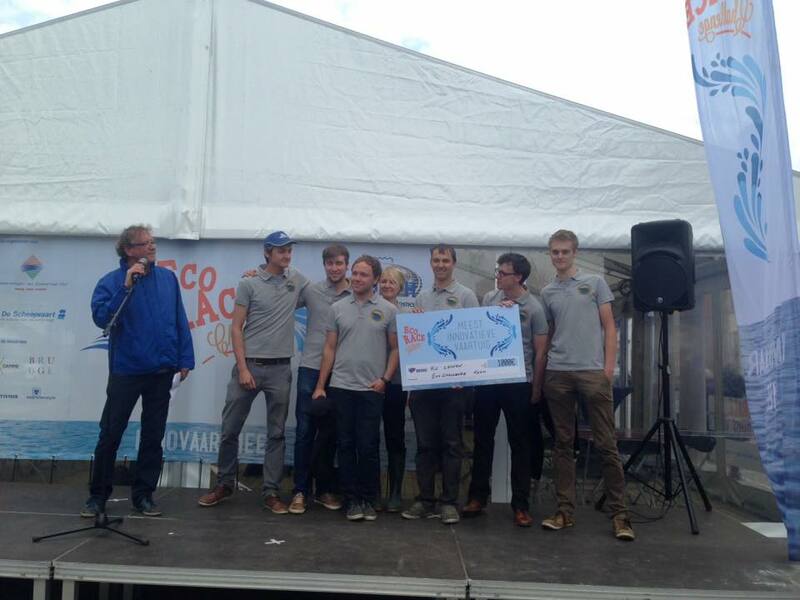 The KU Leuven Navex e-boat team won the price of the best business plan: as mentioned in an article on the KU Leuven site. We were preparing diligently and worrying a lot about the second day of the competition - endurance challenge. We had to show that Galena can do what it was designed for - carry the cargo along the inlands waterways. We we lucky to have the opportunity to carry not only "dead" weight, but also passangers - members of the International Cargo Team as a passengers. 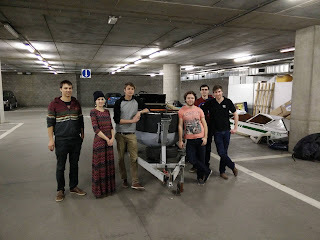 We would like to thank our fellow team for their help - they supported us a lot during the endurance test. We anxiously waited for the announcement of the decision of the jury in the afternoon - our boat didn't show it's best during the first day of the competition on one hand, on the other hand, other teams presented very interesting and innovative solutions. Decision of the jury made our hearts beat twice as fast - Our Team and Gelana were recognized as the Most Innovative Team and All-Round winner of the Ecorace Challenge Competition in the cargo category! Without support of our Coach and our Partners - GALENA, GSA, HELILEO, Septentio, Nanotec, National Instruments, Vario Drive, Vink, Bohez, Fencom - we would not be able to achieve such a high result and we would like to thank them for all their help throughout the project! The first day of the competition brought us a lot of emotions! The most exciting moment was, when we put Galena in the water after the team briefing. Then the challenges started. In the first challenge - sprint - Galena passed awesome. It performed even better than during our test drives! Unfortunately right before the second challenge we started to observe the problems in the electrical wiring, which caused issues with the boat steering. Even though we finished both further challenges, our performance was far from the one we could have shown. The evening and early morning were dedicated to the brining Galena back to the optimal shape and we plan to demonstrate all it's capabilities during the endurance challenge today. See you toda at 10:00 - official start of the endurance challenge! 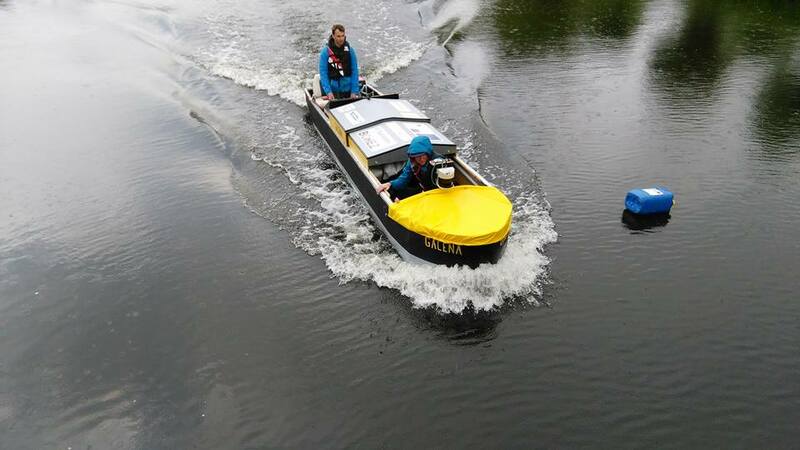 We were very lucky with the weather these days and water tests of our boate - De Galena - bring us lot's of fun. Of course, not everything goes as expected during the testing, but thanks to the thorough preparations for the tests, creativity and team spirit we find solutions even for the issues that look unresolveable from the first sight. We would like to share with you video filmed during our water tests and invite you to the Ecorace Challenge Competition, which will take place on the upcoming weekend in Brugge. More information about the competition you can find on the Ecorace Challenge web site. Easter Holidays? No, only hard work! On the first day after the Easter Holidays we would like to share with you our latest news. The Easter Holidays gave us the opportunity to gather together and start the boat assembly. After finalization of the Bow Populsion and Drive Train systems' design, we were lucky got get support from Vink, Nanotec and Vario Drive, when getting the parts that we need. Almost all of the required components have already arrived and we're very excited to move on to the next phase of the project - assembly. Another good news is that now we have a new trailer and we have done our first water test! 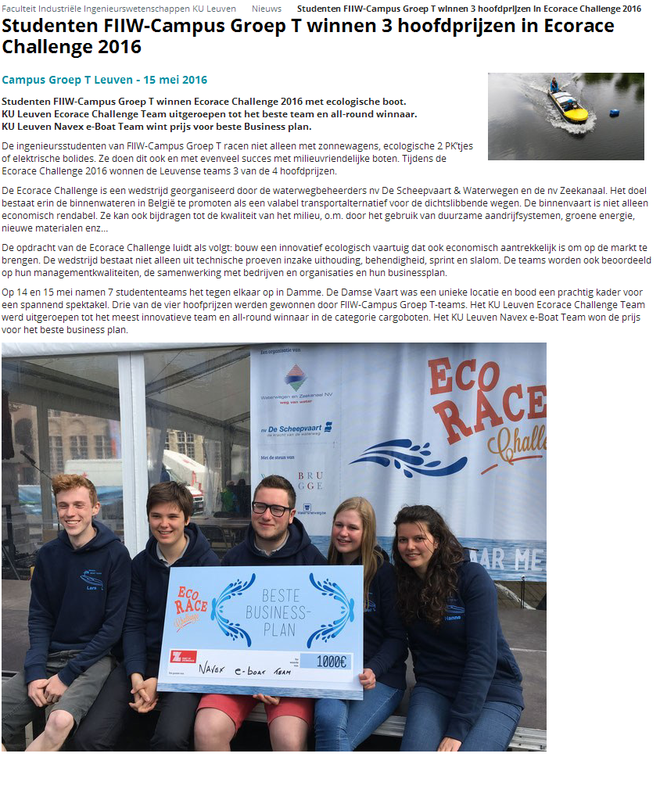 Een update over het team verantwoordelijk voor de ontwikkeling van een boegsturing systeem voor de boot van het ecochallenge team. De conceptfase is zo goed als afgerond. Ons leidingsysteem is af en dankzij onze sponsor Vink NV zijn de nodige componenten reeds in ons bezit. Nogmaals bedankt via deze weg voor de vlotte en vriendelijke samenwerking en de snelle levering van de componenten. Via dit leidingsysteem zal het water dat opgepompt wordt van onder de boot verpompt worden naar ofwel de linker kant van het schip ofwel de rechterkant. Dit wordt geregeld met behulp van de pneumatische 3-weg klep die gestuurd wordt door een pilootventiel. Om terugvloeiing van het water via de andere pompen te vermijden is er gekozen voor 3 terugslagkleppen die werken met een vlotter zodat de extra leidingsweerstand zo klein mogeljk blijft. Met behulp van de versmallingen op de uiteinden zijn we in staat de nodige kracht te leveren om de boot te bewegen. Ons rest nu enkel nog de assemblage en het uitvoerig testen van het systeem. A small update from the team responsible for the development of the bow steering system for the boat of the ecochallenge team. The concept phase is almost finished. Thanks to our sponsor Vink NV we are now able to build and test our piping system. Thanks again for the swift and friendly cooperation’s and the fast delivery of the components. 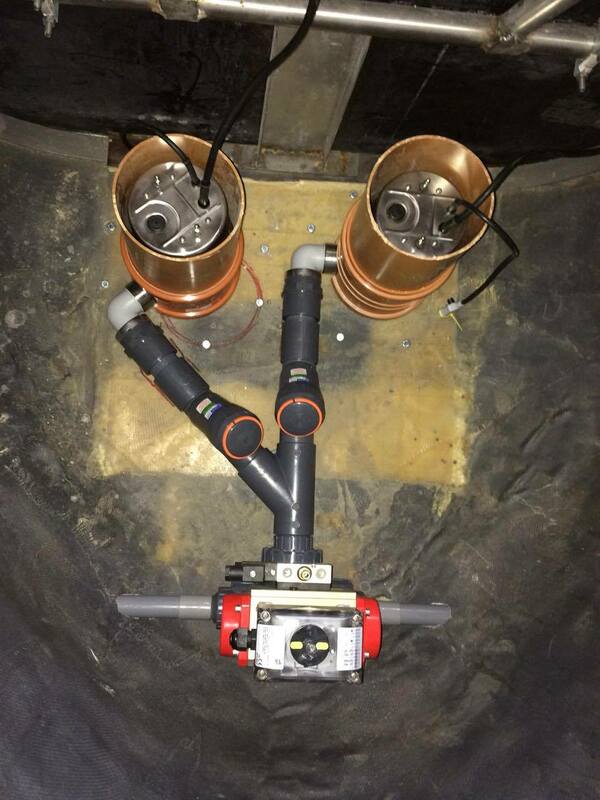 With this piping system we are able to move the water pumped from beneath the boat to either the left or the right side of the boat. 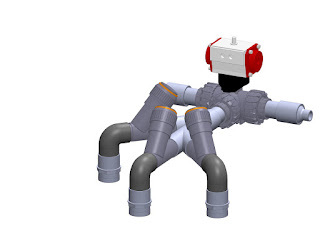 The required direction is regulated by a pneumatic 3-way valve that is actuated by an pilot valve. 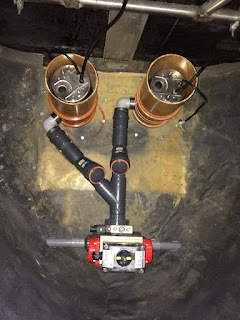 To prevent the water from flowing in the wrong direction and leaving through one of the other pumps, if only one or 2 pumps are working, we implemented check valves. By implementing nozzles at the end of the piping system we are able to achieve the required force to move the boat. Only a few things remain on our to-do list namely building and testing our designed system. KU Leuven Ecochallenge Team wishes you Happy Holidays! May your Holidays Season bring your lot's of good emotions and memories and May new 2016 bring your success in all your endeavours! Thank you for your support in 2015 and we'll keep you updated in 2016!